Most of us live in cities nowadays. Stuck in the concrete jungle, we believe that gardening is not available to us. Even growing small plants in pots isn’t possible if you have a small balcony. And having a backyard garden for most sounds like a dream. But, indoor gardening is now a real option for anyone. With the new technologies, it’s made available and trouble-free. There are many ways and tools to make it possible. A grow tent is among the top ones. 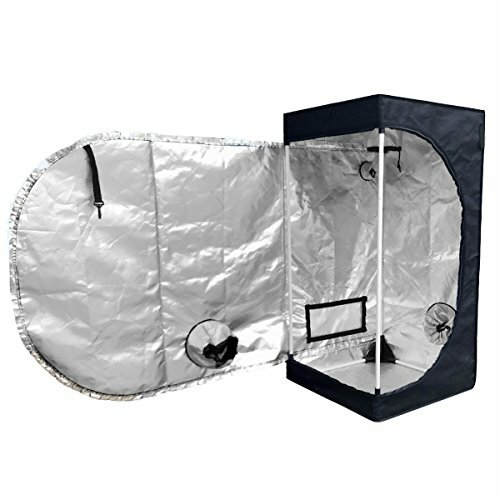 Grow tents are reusable, portable grow spaces. They are made of canvas on the outside, and reflective materials on the inside. Using them, you can raise plants in closed areas. Lights, smell, and watering all stay within the tent. In other words, the shelter makes you the god of your own garden, in the comfort of your own home. 2 Why Use a Mini Grow Tent? 4.1 What can I grow in mini grow tents? 4.2 Are mini tents as effective as large tents? 4.3 What are some deal breakers when choosing my tent? So if you are just getting started, or simply want to grow your own tomatoes, for example, then a mini grow tent is what you want. Let us take a look now at some of the best choices for you. Quictent is a brand famous for its various kinds of tents. Now, they also produce grow tents. Among other offers, they bring us this compact device for single-plant growing. And for all environmentally aware people out there, you will be happy to get this one. It is SGS approved to be eco-friendly! The outside of 600D cloth will not tear or break. It is double-stitched to prevent the bother of having to re-stitch your tent. The Mylar on the inside is 100% reflective so it will hold all the heat and the light inside the tent. All the materials are approved to be non-toxic, meaning they will not harm a plant, no matter how sensitive it is. On the Quictent mini grow, the bars of the frame are thicker than in your usual tent so it will hold for a long time. There are also tool bags and poles for hanging equipment, all guaranteed to last. The top has three vents for air-passage and electrical supplying. An easy-view window is covered first in plastic and then with the same cloth as the rest. Just unzip it to check up on your plants. With this small tent, it’s best to use LED lights. You’ll prevent both overheating and too much electrical consumption. Another thing to suit the users is that there’s a 2-year warranty plus a lifetime free replacement of some parts. So it’s worth your buck. Topolite is one of the best selling gardening tent brands on the market. If you plan to grow tall plants, this tent is for you. It is very narrow, and its compact design means you can even put it in the corner of your room. The tent is made of 600D oxford cloth. The fabric is not the strongest out there, but it’s still strong enough. It won’t allow for any smell or light leakages. And it’s tear-proof, guaranteeing nothing will enter your tent either. The inside consists of 96% reflective diamond mylar. This material is waterproof and will enhance the effect of lights within the tent. The bars used for the frame are metal and sturdy. But, unlike with other kinds, they are coated in white paint, which additionally enhances the reflective effect. The zippers are high-quality, big and heavy duty. Topolite tent is one of the two tents on the list which suffered zero complaints related to the zipper quality and light leakages. The device includes many vents for fanning, filtering, and electricity. As an extra, you get a convenient viewing window. The floor is removable and waterproof. If you worry about the cleanup of your tent, this will be a big plus for you. Just remove the tray, clean it, and put it back in. And last but not least, it’s quite easy to set up by yourself, without extra tools, and the price is lovable. The only big negative is that this Topolite tent model comes without warranty. 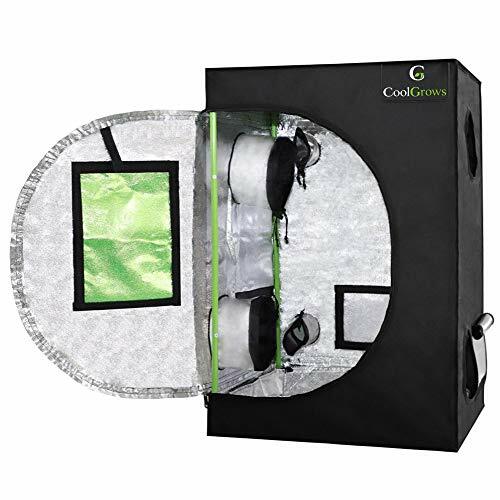 This CoolGrows hydroponic grow tent is one of the the shortest tents in the offer, measuring in at 2×2. So if you worry about ceiling space, this is the right tent for you. This is a tent designed explicitly for growing plants from seeds and clones. And it will endure years of usage. The quality of the materials is high. With the exterior made of environmentally friendly peva (pvc free), this tent takes pride in being heavy-duty. The interior is completely lined with reflective, waterproof Mylar. Apart from that, the frame is constructed of durable metal poles, enabling this small tent to take a lot of weight. Unfortunately, there are no bags for tools. This makes sense, since it’s constructed to be compact, but is still a disadvantage. The ventilation system is excellent. The side ducts allow for ventilation. The extra rectangular vents on the sides are pest-proof while allowing for fresh air to enter. And, an implemented observing window stops the gardener to disturb the growth out of the desire to check on them. When it comes to light, the shortness of this tent means using metal halide bulbs is out of the question. These bulbs could burn and harm the plants. Growing in the Yield Lab, you will have to use LED or fluorescent lights. 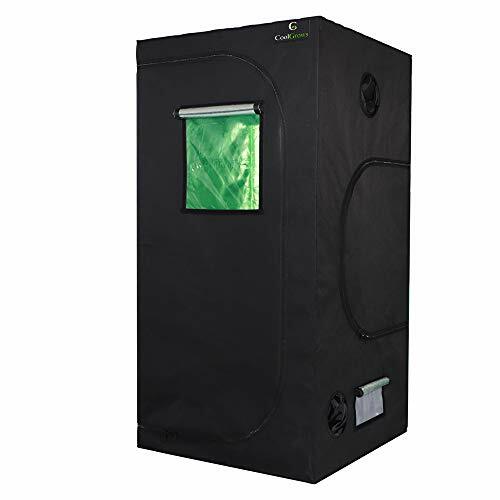 Cool Grows comes at us with this slightly tall and slim grow tent. For gardeners who have spare closet space and are looking to cultivate, this tent’s design offers a great choice. It measures in at 3×3. The design focuses on durability and being tear-proof. With the 600D polyester outside, and inside Mylar which is 99% reflective, this tent will not let in any light. The frame consists of metal bars so it will hold the tent up for many years of usage. And yet, it is affordable! The setup of ports for ventilation and electricity is admirable. The tent is a very efficient growing space. Plus, a particular feature of this one is that the front window filters out white light. This fact further lessens the concern that you are disturbing your plants. When it comes to light leakages, they can be a problem with many tents. That is why Cool Grows manufacturers designed the material to go over the zippers. The removable spill tray on the floor allows for getting rid of extra water and dirt from the inside an easy task. As well as with the previous one, the best bulbs to use would be LED or fluorescent ones. But the height may allow you to use a stronger light without fear of burning. This is surely an all-around strong value 3×3 grow tent. 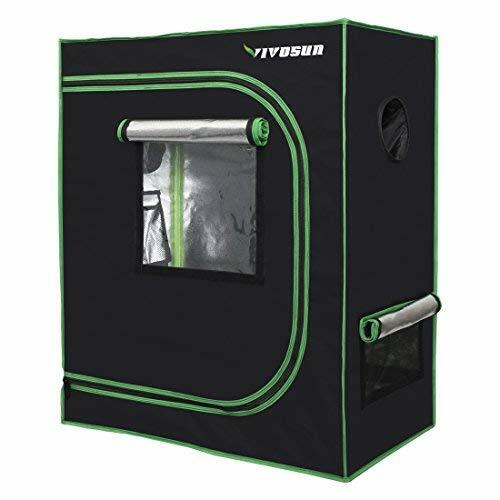 Not the smallest tent in offer, this Vivosun product will fit two plants at the same time. It’s sturdy and will meet the needs of gardeners who plan to seed and clone! The exterior is, of course, made of heavy-duty 600D cloth. The interior is of 98% reflective Mylar. With the frame of sturdy metal tubes, the tent will hold steady. The structure also has two support poles, and with metal rings for hanging lights and other tools. This design provides a perfect, safe environment for your tent. All the ports for venting, fresh air, and electricity are sealed by zippers. Yes, the zippers were a problem with many other tents. The Vivosun creators went through great lengths to ensure that doesn’t happen. The floor consists of a tray made of waterproof materials. It’s removable, so the clean-up is easy. You will have easy access to your plants because the doors are broad and well set up. There’s also a small window so the cautious users wouldn’t hassle their plants too much by checking up on them. For this tent, it would be best to use LED lights. But if you’re cloning, a fluorescent bulb is your best choice. The easy installation and two-year warranty ensure that the money you spend on the purchase is the end of your investments. Why Use a Mini Grow Tent? The answer is simple. Because you can pursue your gardening passion. Because that way, you can have your own, home-grown fruits and veggies. So what are the benefits of using a grow tent? First of all, because then you can have a garden all throughout the year. You no longer have to fret the weather conditions or even depend on the climate of the place where you live! If you have available places in your home, you can take advantage of that even if actual, outdoor gardening is out of the question. An indoor growing space may be as small or as big as you want. As well as meeting your needs in terms of space, it saves money. The tents boast with efficient use of energy. In the long run, besides pursuing a hobby you enjoy, you will save up growing your own food. And that’s especially true if you’re a fan of more exotic types of fruits and vegetables. And your homegrown products will be healthier. Since you’re growing in a closed, indoor space, you don’t have to worry about pests. Going organic and ditching the pesticides is now that much easier. And finally, they are easy to use. The set up is light and straightforward. The growing process too is much less complicated – you have complete control over it every step of the way. So there will be no surprises, as long as you stick to the prescribed mix of lighting, water, and ventilation for your desired yield. Nowadays, with the growing popularity of these gardening tools, the choices are many. Some tents offer features that make them the obvious choice. But size is not one of them. So, how to decide how large to choose? First of all, measure the space you have available. These tents now come in many different shapes and sizes so they can accommodate your needs. Choose one that you can actively use. Now, consider what you want to plant. You may be planning on making a little garden with many plants for yourself. In that case, you will need a large grow tent, one that you can enter. But, if you just want a few shelves of plants a time, a mini tent is a better option. Another thing is that mini tents are much shorter. So you should be cautious when choosing the lights you will use. Some stronger bulbs may burn your plants if they get too close. Of course, you must check how tall your desired plants will actually grow. Choose a tent higher than that, because you will need equipment space. Here are some basic pros and cons of both size choices. Remember that there are also middle-sized options if you’re indecisive. What can I grow in mini grow tents? An indoor tent allows you to create a set of conditions perfect for growing any type of plants you want. But, if you plan to cultivate more plants at the same time, be sure to check the conditions they need. Growing plants which ask for similar circumstances ensures the success of your yield. With mini grow tents, another consideration deals with the size of the developed plant. So be sure that a fully grown specimen still has space in your tent, and you’re good to go. Are mini tents as effective as large tents? Of course, when it comes to the size of your yield, the answer is no. A 2*2 tent can fit only a plant or two, and the largest of the ‘mini’ kind still don’t suit more than a couple of plants. Another possible drawback on effectiveness is the lights you can use. Smaller tents usually need weaker light bulbs. But a mini tent will grow your plants as well as any large one. 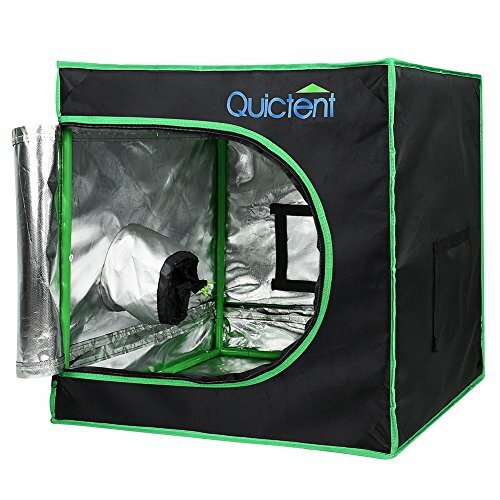 If you’re a beginner or if you’re trying to specialise in a new type of growth, this tent may prove even more effective. Having complete control over a smaller space is an easier task. What are some deal breakers when choosing my tent? It depends on how you plan to use it and how much you’re willing to spend. But there are some things you should never settle for. That’s especially true considering that the offer is growing. Nowadays even high-quality ones come with decent prices. Type of canvas is not extremely important if your plants do not need complete darkness. Yet, if they do, always look for higher-quality cloth. You don’t want an entire yield ruined because of light leakages. If the reviewers complain about ventilation, that’s a huge red flag. Any plant requires proper ventilation to thrive. This is not exactly a deal breaker, but we would strongly advise against buying a tent with a plastic frame. It’s a hassle you don’t need in your life. Most zippers aren’t made perfect, as we saw above in the review. That’s why a warranty is what you need if you don’t want to spend extra money on new zippers for your tent. We cannot say which of the listed products is the best for you. They are all quite similar. The choice depends most on what you personally need and intend. So don’t trust us only, and check the reviews if you want to be sure. That being said, we must admit the Quintescent one showed itself to be the least problematic one. Its eco-friendly features and great warranty conditions are a plus for any aspiring indoor gardener. We hope you found this helpful and wish you a good yield and an enjoyable growing experience!